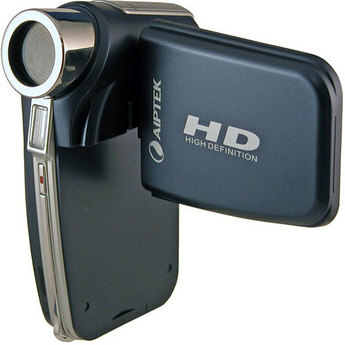 The Aiptek A-HD 720P is a very simple, basic camcorder that provides HD quality images. It’s very small and designed to be hand held on-the-go. A low-budget beauty, the aiptek A-HD 720P is inexpensive, yet still delivers high-def clarity. This camera is priced at just $110. It records on a memory card and you can go up to 32 gig, which is a high storage capacity for a little camcorder. The Aiptek A-HD 720p is an all-in-one unit that does everything you need for easy online video production. This one unit functions as the camera/microphone/uploader. If you are looking for EASY, this is it. Meant for easy internet video production. The A-HD 720P also functions as a personal media player. You can watch videos, still images or listen to recorded audio from the TV, or favorite DVDs. The Aipek A-HD720p video HD camera has a night shot feature to give you usable video and still images even in low light but some people on forums report being a bit disappointed with the graininess of low light pictures. Graininess is to be expected in low-light digital photography, of course. The aipek ahd720p records in .mov format (quicktime) so editing on a Mac would be a breeze but editing on a PC would require conversion. The image censor is a 5Mp CMOS (2592 x 1944) 1280 x 720 H.264 Video@30fps. If you are seeking an inexpensive video camcorder that will take quality pictures without much effort, this is a good buy.